Overheard this at a tattoo parlor a few days ago. 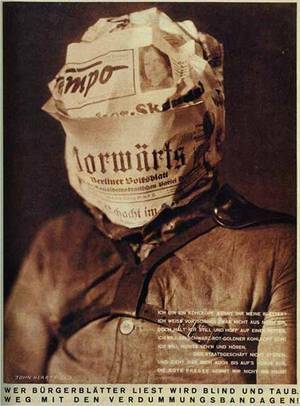 So, thought I'd showcase some of John Heartfield's excellent work; a German artist from the 30's whose art was often a kind of inverted, anti-propaganda response to the Nazis and their rise to power. 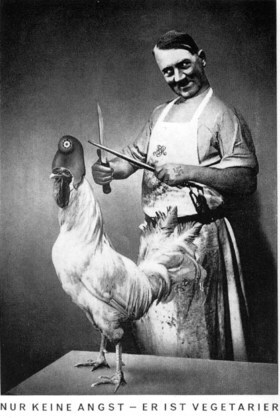 While in Berlin, an art museum held a retrospective of his work. 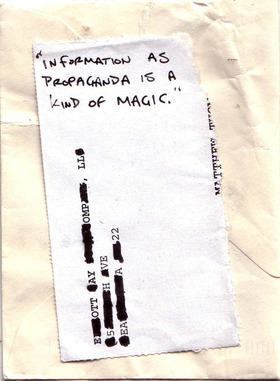 All over the city were immense flyers of this last image: the hyena crouched and laughing over bodies of soldiers. 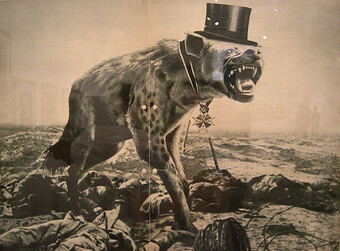 I encountered it everywhere, my Summer of Heartfield's Hyena. I remember, one afternoon, riding along the canal on my bike, following a path that cut through the Zoologischer Garten and ran right beside many of its animal enclosures. At one point I stopped to peer into the fence, perhaps I'd catch a glimpse of an elephant, a zebra in the distance. There was only the small opening of trees, at first. Then vooohm. The hunched and tan shape of it bursting from the bushes, a hyena just there, a mere two feet from me. Without moving, more appeared, as if my eyes were adjusting to the dark. A half-dozen all at once, scattered across the thin grass and staring back out at me.